All remaining United States nuclear-related sanctions will resume effective November 5, 2018. These include sanctions targeting Iran’s energy sector, including petroleum-related transactions, as well as transactions by foreign financial institutions with the Central Bank of Iran . . .
Iran threatened the United States. President Trump told them not to do that. While it certainly feels great to respond so forcefully, I’d like to know if Trump is ready for a war with Iran. I’m certainly not. Unless Iran is on the verge of making nuclear weapons, there’s no reason to start a war at the very moment protests within Iran are gaining strength. The difference here is that Iran makes idle threats we can ignore. The United States should never make idle threats, because doing so undermines the legitimacy of what we say and destroys our ability to influence world events. I assume Iran will shut up, because they don’t know what Trump will do. Because if we don’t know what Trump will do, then they don’t. But Trump should not be threatening war in any case. Now that he has ended the Iran nuclear deal, let the sanctions have their effect, step up propganda toward average Iranians, and see if the Ayatollahs are overthrown. The Obama administration repeatedly lied to Congress about whether Iran would be able to access the U.S. financial system as Obama officials completed, and the Senate vote on, a nuclear with the rogue nation. According to the report, released Wednesday by Republicans on the Senate Homeland Security Committee’s Permanent Subcommittee on Investigations, Iran was desperate to access billions of dollars stored abroad. The most efficient way to do this was to use the U.S. banking system in order to convert the funds into Euros. But it had been barred as part of sanctions regime from using U.S. banks, even under the Iran deal. Both before and after the deal was signed and voted on by Senate, the Obama administration assured Congress that Iran would not be able to access U.S. banks. But not only did it allow Iran to do so, it encouraged U.S. banks to complete transactions for Iran. The banks refused, however. As the United States negotiated with Iran, one important U.S. interest consistently remained off-limits: Iran would not be granted access to either the U.S. financial system or the U.S. dollar. Senior U.S. government officials repeatedly testified to Congress that Iranian access to the U.S. financial system was not on the table or part of any deal. This notwithstanding, the U.S. Department of the Treasury, at the direction of the U.S. State Department, granted a specific license that authorized a conversion of Iranian assets worth billions of U.S. dollars using the U.S. financial system. Even after the specific license was issued, U.S. government officials maintained in congressional testimony that Iran would not be granted access to the U.S. financial system. The Senate disapproved the deal in September 2015, but not by enough votes to sink it. Six months later, the Obama administration was still lying about it. Just three months earlier, the same agency issued a specific license for Iran to access to the U.S. financial system and the U.S. dollar. Iran eventually found other ways to convert its money to Euros so it could access it. Hillary Clinton complained Wednesday that nobody’s going to trust the United States anymore now that President Trump pulled out of the Iran nuclear deal. First of all, please, shut up. You were picked to be secretary of state without having an ounce of foreign policy or negotiating experience, and it showed, much to our detriment. And go away. Your credibility is shot when you set up a secret email server, dropped classified information on it, and deleted 3,000 emails. Secondly, the credibility of the United States was shot when Barack Obama decided to violate the Constitution and negotiate a treaty without getting the approval of the United States Senate. In fact, not only did Obama not have the two-thirds majority needed to approve the agreement under the Constitution, there were about 58 senators who were against it. So what was negotiated was not an agreement between the United States and Iran. It was an agreement between Barack Obama and Iran. And Barack Obama is no longer president. Actually, this is not what we are trying to do in North Korea. In North Korea, we are trying to completely denuclearize the country, not leave it with a program that it can begin developing again in a few years right up to the point where it can produce mass numbers of weapons. Obama should stop whining. He went and signed a bad, unpopular treaty and then violated the Constitution by not submitting it for approval by the Senate. Instead, he turned the Constitution on its head by making the Senate have to vote to disapprove it, which it couldn’t. Without Senate confirmation of the agreement, it can be simply overturned by his successor. Too bad, Obama. John Kerry was a disastrous secretary of state who gave us the ruinous Iran deal, did nothing about North Korea, and now is interfering with President Trump’s foreign policy by illegally conducting his own. Kerry has been meeting with foreign leaders, including the Iranians, in an attempt to save his precious, painstakingly negotiated handiwork. As usual, Trump has homed right in on his enemy’s weakness. Kerry no doubt can’t get over the fact that he never became president. So he had to do “big things” as secretary of state. He tried to resolve the Israeli-Palestinian conflict, and when that failed, he struck a grand bargain with the ayatollahs that essentially just delays recognition of their nuclear program. I think Trump should confront Iran, but I think he should wait until he has settled things with North Korea, as I wrote here. But John Kerry needs to spend more time sail surfing and less time adding to the damage he has done to this country. 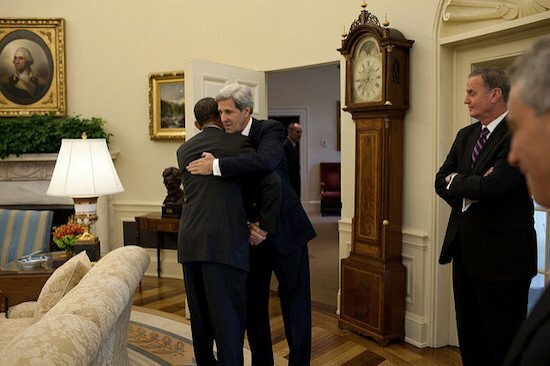 I mean, the guy can’t even figure out whether to give a hug or a handshake.